Anna Kipervaser is a Ukrainian-born multimedia artist who currently lives and works in Durham, North Carolina. Her work spans multiple disciplines including experimental and documentary moving image works in both 16mm film and video. Her work screens at festivals, in classrooms, galleries, microcinemas, basements, and school houses! 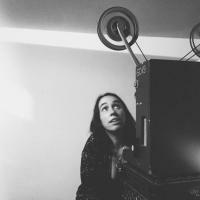 Anna has received a number of awards for her moving image work and most recently was an artist-in-residence at LIFT in Toronto where she completed a new 16mm film. Anna is also painter, printmaker, curator of exhibitions and programmer of screenings.